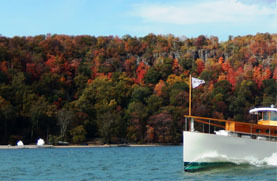 Try and unique way to view the foliage and join us for a Boston Fall Foliage Cruise. Whether you are a local or a visitor to New England, you know that New England has the most magical fall foliage in the country. 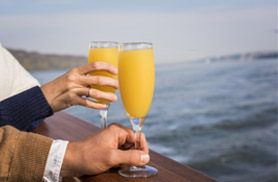 Rather than taking a car ride down a country road, hop aboard our 1920s style yacht Northern Lights and cruise elegantly out to the Boston Harbor Islands to take in the breathtaking foliage. 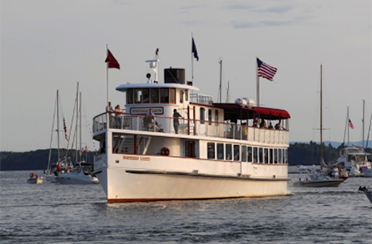 A Boston Fall Foliage Cruise is a great way to spend the weekend afternoon with friends and family. Watch the green leaves change into a brilliant crimson red, pumpkin orange and a golden yellow along the New England coast. Feel the crisp autumn air upon your face as you glide out to the Islands with a blanket wrapped around you and a hot cup of cider in hand. Enjoy a picnic lunch on this afternoon cruise with a group of your close friends, or share the afternoon with your children aboard this fine boat. Grab your camera and capture a picture of you and your honey with the New England fall foliage colors in the background!